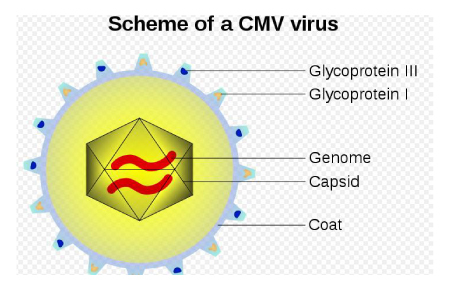 It seems that humanity’s old nemesis, the Cytomegalovirus (CMV), that up to 80% of us are infected with by the age of 50, not only ages us and gives us a lower case version of aids (acquired immune deficiency syndrome), but it does so in an even more nefarious way that previously understood – microcompetition. A study just published in Open Medicine by Polansky and Javaherian showed that CMV microcompetes for the on-switch that the host cell makes: the GABP transcription factor. In the host cell, that GABP would be needed to trigger production of a critical telomere stabilizing protein known as Telomere Repeat Binding Factor 2 (Terf2). Here is the lay-person’s summary of the article. So we suspected that chronic CMV infection ages us but we only conprehended that the immune system burns out fighting it. Until this paper, we didn’t realize that it also steals the healthy gene transciption factors that the host cell needs to stabilize its telomers. It’s a double whammy. In this 2010 study of the original Patton Protocol patients taking telomerase activator, TA-65, the most striking finding was a decrease in the “burned out” T-Cells in patients infected with CMV. The same effects were noted using telomerase activators in a 2008 UCLA study involving HIV-infected T-Cells. The markers for “burned out” T-Cells decreased in response to telomerase activation. So we see that AIDS, aids, and aging itself are all contributing to each other and each others’ shadows. But there is hope with telomerase activation that these processes can be reversed. To read about an amazing case of immune system rejuvenation, read this blog. about a man who conservatively gained 40 years of immune reserve after taking TA-65 for two years.